Looking for a few good beach reads for your summer travel assignment? We’ve got you covered! Whether you hanging out at the beach or waiting in an airport terminal for your next flight, a good book can make any travel nurse adventure more fun. 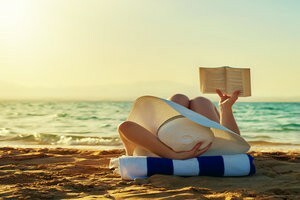 So, in the name of summer road trips, we’ve compiled 5 fantastic summer reads for the travel nurse. Happy reading! The Immortal Life of Henrietta Lacks: In 1951, Henrietta Lacks, a poor black farmer, was dying from cancer. Before her death, some of her cells were removed during a biopsy and cultured without her permission. Henrietta’s cell line, known by scientists as HeLa cells, became the basis for several medical breakthroughs, including the polio vaccine. Today, however, Lacks’ family can’t afford health care. This 2010 bestseller tells an astonishing story where race, science, and ethics collide. Anatomy of a Super Nurse: The Ultimate Guide to Becoming Nursey: This is a must-read for any recent nursing school grad! Acclaimed blogger and author Kati Kleber, BSN, RN, CCRN, shares her experiences and provides hilarious insights and practical tips on how to survive that crucial first year in the nursing field. Even seasoned nurse veterans will get a chuckle out of Kleber’s storytelling. The Hospital at the End of the World: Thinking of taking your travel nursing skills overseas? Then you need to pick up The Hospital at the End of the World. This nonfiction narrative describes one nurse’s adventures while teaching for a summer in Nepal. It’s Eat, Pray, Love meets Seven Years in Tibet. I Wasn’t Strong Like This When I Started Out: True Stories of Becoming a Nurse: This is a collection of short stories about real-life nurses’ experience in the demanding world of healthcare. Several nurses in different stages of their career share their “firsts”, their struggles against burnout, and ultimately what keeps them in the profession. Warning: This book will make you laugh and probably ugly cry. Outlander: If you’re looking for pure summer escapism, you won’t regret reading Outlander. In this Diana Gabaldona bestseller, WWII British army nurse Claire Randall accidentally travels back in time to 18th century Scotland. While trying to find a way back to her own time and husband, Claire is forced to marry Jamie, a young Highlander. Things get complicated when Claire finds herself falling in love with the Scottish warrior. Wherever your travel nursing journey takes you this summer, we hope you enjoy these great reads! P.S. What are you reading this summer? Let us know in the comments below! This entry was posted in travel nurse advice, Travel Nursing and tagged featured, travel nursing central by TNC. Bookmark the permalink. Great work here…keep it up!! !